There’s very little question about it, when it comes to protection on a motorcycle, leather is where it’s at. Which is all well and good, until it rains, and that happens an awful lot here in the UK. Leather just isn’t very waterproof and soon becomes water logged, heavy, cold and pretty miserable to ride in. This is where this little tub of wax named Mr JoJo comes in. I picked up this Mr JoJo wax up at the MCN show a couple of months ago, cost me a tenner for a 200g tub, with a few sponges thrown in. The sales chap demonstrated it on our boots with a spray can of water. Seemed worth a punt. 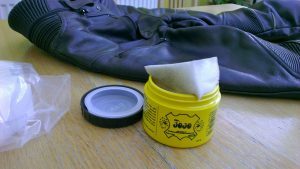 It’s name, Mr JoJo, doesn’t seem to have any relation to a certain Madame JoJo’s of Soho fame, but is a leather waterproofing and conditioning wax from URAD, which contains Jojoba oil. This oil comes from the little Jojoba shrubbery that grows around Mexico, Arizona and California, and is a popular alternative to Whale oil. The wax is white in colour and has a distinctive sweet smell. Application is dead easy, you just use one of the provided sponges, dunk it in the pot and then smear it over your leathers. It spreads easily and soon goes clear to leave your leathers looking glossy and supple. But the proof of the pudding is how well your leathers hold up in the rain afterwards, which turns out to be pretty damned good. Obviously they didn’t hold up as well as my textile gear, but did still keep me dry underneath after a light rain shower on my 45 minute commute. The big problem is my leathers have sections of stretch material, which will never hold up against the rain. Also, some sections of the leathers has small breather holes and being slim fit around the legs, tuck into my boots, which is where rain eventually runs into. Ultimately, I wouldn’t want to ride through a heavy rain storm for long periods with just leathers and this wax to protect me, but it’s perfect to avoid worrying about the odd light shower. 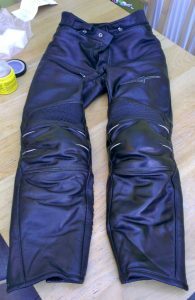 The wax was also great for rejuvenating my tired old leather trousers, moistening and softening the leather. It also helped lube up the zips so they ran smoothly and got them smelling nice. Jojoba oil is a natural fungicide and prevents mildew, which is good to know. This was of particular note when it came to a second hand leather jacket I picked up off ebay recently, which totally stunk of fags – yuck! After a good clean with disinfectant and NikWax leather cleaner, the wax did a good job of getting of most of the stench and masking the slight whiff left. All in all, I was pretty pleased with the stuff. At a tenner a tub, with still half left after doing a couple jackets, trousers and the kids schools shoes! – it’s not bad value for money. Will definitely be buying more. Buy the URAD Mr JoJo wax from Arthur Carter Ltd – sole UK distributor. Disclosure: I bought this product with my own hard earned cash and review it here with no association with the manufacture or seller.